The newspaper L’Eco di Bergamo just published an article about Grifal’s upcoming listing on the AIM Italia stock exchange. We just finished our roadshow and were greeted with a lot of investor interest. Now we begin the formal process to be a listed company. The article can be found on page 9 of the Friday, May 18th issue of the paper. Innovations in sustainable packaging Grifal, a global leader in packaging solutions, will be showing its next-generation technological innovations at IPACK-IMA 2018, Italy’s premier trade show for the packaging industry. The company will present its groundbreaking materials for packaging, custom packaging design and its ISTA-certified testing services conducted in its own laboratory. cArtù®: The star of IPACK-Mat! Grifal is bringing cArtù®, its revolutionary corrugated cardboard that is simultaneously cushioning, flexible and extremely resistant to compression, to IPACK-Mat (Hall 14, Stand C36), the new satellite trade show that takes place alongside IPACK-IMA dedicated to innovative new materials and premium packaging solutions. cArtù® is able to substitute the plastic components commonly used in protective packaging. Grifal is going to the 2018 Packaging Oscars! The winners of this year’s Packaging Oscars will be announced on the 30th of May in Hall 14 of IPACK-Mat 2018. Grifal is among the selected finalists with its all-cArtù® solution for Gewiss floodlights. The winner will receive the prestigious “Oscar dell’Imballaggio” presented by the Italian Packaging Institute. Grifal’s solution for Gewiss, running for the Italian Packaging Oscars, Best Packaging 2018 Where to find us: Hall. 10 Stand D30 - E29 | Hall. 14 Stand C36 (IPACK-mat): FieraMilano RHO When it is possible to visit the fair: IPACK-IMA will be held from 29 May through 1 June, from 09:30 until 18:00. How to get to IPACK-IMA (FieraMilano Rho) It's easy to get to the trade show by car, train, metro or via the Malpensa Shuttle. All travel information is available on the official website of IPACK-IMA (click here). With its successful roadshow just completed, Grifal has begun the process of book building in advance of its imminent listing on the AIM Italia market. Investor interest is very strong and the listing should take place at the beginning of June, as reported here on the website of the Borsa Italiana. Today is day one of the Grifal IPO roadshow. The company, located in the province of Bergamo, is a supplier of industrial packaging solutions and the owner of multiple patents such as Mondaplen and cArtù. It hopes to begin trading on the AIM exchange of the Borsa Italiana by the end of Q2. The capital raised will be used to expand distribution in Italy and abroad, to develop an online sales channel and to further invest in research and development in technology as well as for the product line. Read all the details of the announcement [in Italian] directly on the TGCOM24.com website. Grifal is happy to announce that we will be presenting cArtù® at IPACK-Mat 2018, the new exhibition space at IPACK-IMA 2018, entirely dedicated to innovative solutions in raw materials, components and high value-added packaging. Read all about it in Impackt by Italia Imballaggio, the supplement dedicated to IPACK-Mat. The show takes place at the FieraMilano from 29 May to 1 June 2018. The IPACK-Mat area will be set up in Pavilion 14, a central location at the fair. Grifal will be showing many different solutions all made with cArtù®, the new corrugated cardboard with extra-tall flutes produced with its own patented technology. This innovative material performs as well as, if not better than plastic materials and is, of course, 100% recyclable. Buxkin, a Dutch company making interior furnishings, has asked Grifal to make special waved materials using recycled leather, felt and wool, and exhibited them in the Archiproducts exhibition at via Tortona in Milan during the Design Week. Buxkin's showroom will remain open for a year and you can visit it for free. Cartunia Design and Consortium Comieco, at the Mudec Light Card Exhibition inside Fuorisalone, presented the GORG lamp and the new curved collection by Cartunia Design realized in cArtú. They are available to the public since the end of April 2017! 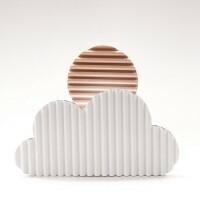 From the Eco di Bergamo: Cartunia Design presents Sunset, the new lamp made with cArtù. Read all about these wonderful cArtù lamps made by Cartunia Design in partnership with Grifal in L'Eco di Bergamo [Italian]. 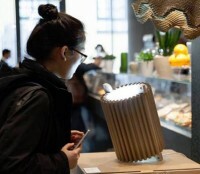 Comments Off on From the Eco di Bergamo: Cartunia Design presents Sunset, the new lamp made with cArtù.